Well the time has come after 3 years of tinkering with this bike to think about the next project, so she's up for sale. 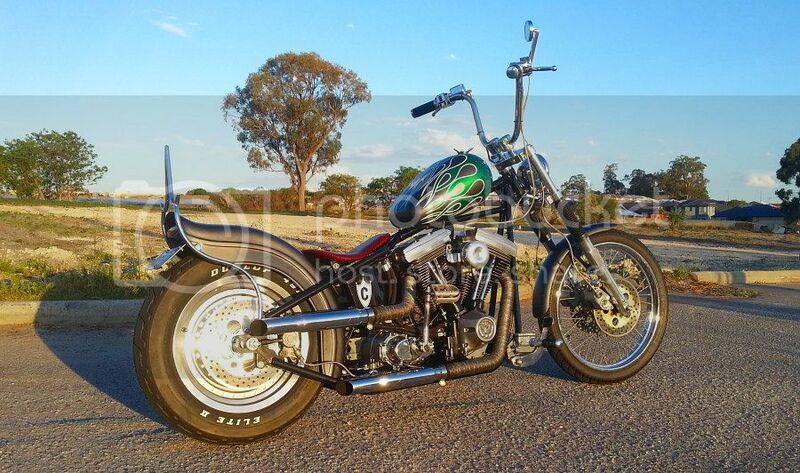 Custom built Harley Davidson powered rigid Chopper. 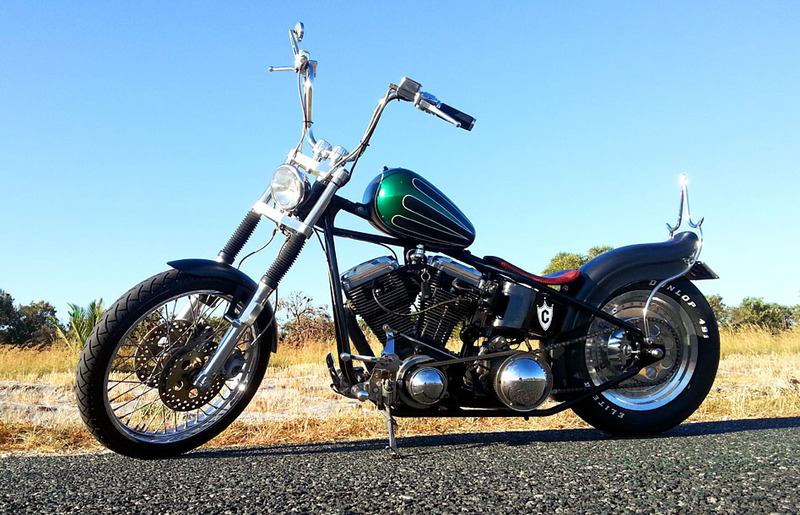 Very much styled after the Choppers Steg Von Heintz and Indian Larry were building at Pyscho Cycles back in the 1980s. 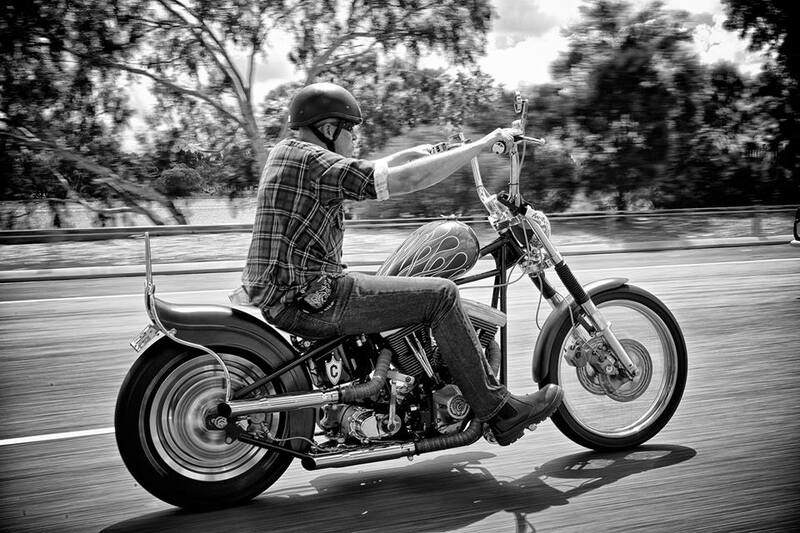 No riding on permits or having to spend thousands more on Engineering and changes to the bike to actually get rego, ride it home now with six months current WA registration. Engine number, chassis number and colours listed on registration paper work match the bike! Asking price is $18,500 but that is negotiable, but selling well below my costs (ingoring labour) so don't waste your time and mine with crazy lowball offers. May consider trade/swap for 40s to 50s American car. Up for sale again and this time very serious about moving it on, so only asking $16,000 this time around and I am flexible on that which is a bargain! This is a great opportunity for a WA member to get onto a fully licensed rigid Chopper without all the legal hassles and at an entry level price. In response I had to a query this week asking if I'd sell it cheaper minus the gas tank. I understand a lot of people prefer the look of a Sportster gas tank on a rigid Chopper and given this gas tank has a lot of sentimental value to me the answer is yes. I'd instantly drop $1,000 off the price, so we can start at $15,000 and negotiate from there minus the gas tank. That is more than enough to buy a Sporty gas tank, petcock, mount it, get a wild killer paint job on it and pocket a heap of change. Congratulations, any idea yet what the next project is going to be? Youngblood wrote: Congratulations, any idea yet what the next project is going to be?